Diazofilms are available in matted (D-18-M) and glossy versions (D-18-G). The matted version is optimally suited for the exposure of liquid resists, because the films can be better registered by the matting. In addition, the matted back of the film provides a faster vacuum in the exposure equipment. The glossy version is better suited for the exposure of dry resists. The diazo films have a marking corner. If it is on the top right, you are looking at the emulsion side of the film. 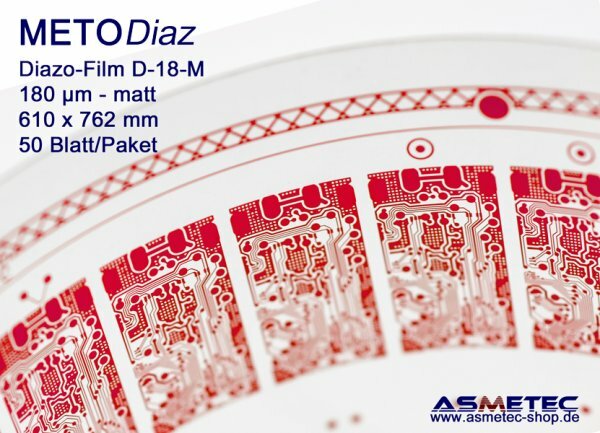 METODIAZ D-18 diazo films are based on a 180 µm thick, very dimensionally stable polyester film, which is coated with superfine diazo emulsion on state-of-the-art equipment. Unlike silver films, METODIAZ diazo films can be exposed to daylight for a short time. They are developed in ammonia vapour at approx. 65 °C. You can also obtain corresponding diazo film developers and spare parts from us. 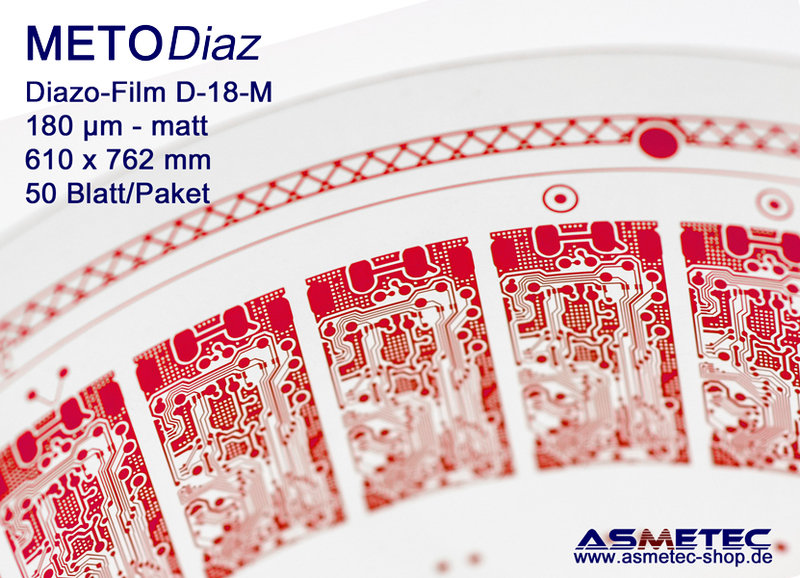 METODIAZ D-18 diazo films absorb only little heat during molecular image formation and thus remain very dimensionally stable. The exposure (max. sensitivity at 390 nm) with UV lamps is absolutely uncritical with today's devices and is done in a matter of seconds. The development takes place in an ammonia developing device (e.g. ASMETEC TEM 22 WP) at approx. 65 °C within seconds. We offer our customers free density testing of their film samples. If necessary, we use the test protocol to provide advice on how to improve film performance. Diazo films should be stored as cool and dry as possible. Under no circumstances should diazo films be stored in the same room as NH3 solution, because this leads to premature development even with closed containers and the films can therefore no longer be used from the edge inwards.